A couple of weeks ago, I wrote Rich Chicken, Poor Chicken (inspired by popular personal finance book). The article was a bit of a humblebrag about an amazing deal I found at Aldi on some chicken. I ended up paying around 45 cents a pound for boneless, skinless chicken breast, an all-time personal record. The main lesson was that by being mindful with your spending, you can save money a ton of money. Getting 45 cent chicken requires a lot of luck. However, you have to be prepared to pounce when the luck is there. Yesterday, I was fortunate enough to get another great deal. Just like with the chicken, I felt like I robbed the grocery store. At least this time it was Shaw’s. This promotion was on a bunch of bulk meat purchases. At the expensive end of the spectrum there were $30 packages of Porterhouse steaks. On the cheap end of the spectrum there was the pork that I bought. You could buy 3 Porterhouse packages for $90 and save $10 to make it $80… or you can do what I did. I looked for the 3 cheapest packages of meat I could find. It happened to be the packages of pork that were $1.89 a pound. That’s not the best price I’ve ever seen, but the promotion turns a good price into a great one. The three packages I bought were $5.42, $4.67, and $5.88 each. The roughly 8.5 pounds of pork came to a total of $15.97. However, with the “save $10” promotion, it was $5.97… or around 70 cents a pound. The key to the deal is realizing that a package of meat is a package of meat whether it is $5 or $30. The promotion doesn’t discriminate between the two. You get your $10 savings either way. If Shaw’s had put that sign on the pork, I’m fairly sure they would have quickly sold out. Mindful math for the win. I’m a naturally thrifty guy, but there are a number of things I believe you get what you pay for. Food is one category. But in this case it was normally priced / quality and you applied an unexpected deal to it. So you get the best of quality and price! Yeah, I can’t fault people if they want to spend more money and buy organic. I do it for some things if the deal is right. For meats though, I pretty bare-bones unless it’s a good restaurant or a special occasion. I assume your forthcoming Rich Man / Poor Man article will tell us about a great deal for cannibals? I look forward to it. Perhaps. I may even modestly propose a few recipes. Sounds like a good deal to me. Thanks for sharing! 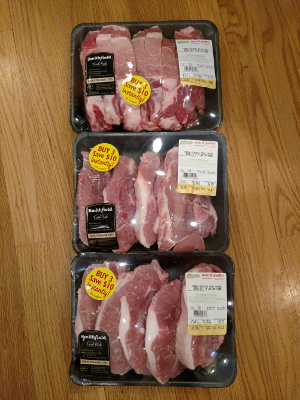 My deal on pork was at Kroger yesterday. They still had Easter hams expiring on the 25th of May for sale at about 75% off. I got two bone in hams for around $13. My plan is to use my meat slicer and cut thick ham slices that can be used for breakfast or dinner. I then use my food saver and freeze for future use. I try to buy the best quality of food I can afford, but with three teens I also have to watch my dollars. Thanks for the tip Michelle. I’ll keep a lookout at my local grocery store. It makes senses that Easter hams would be expiring soon.